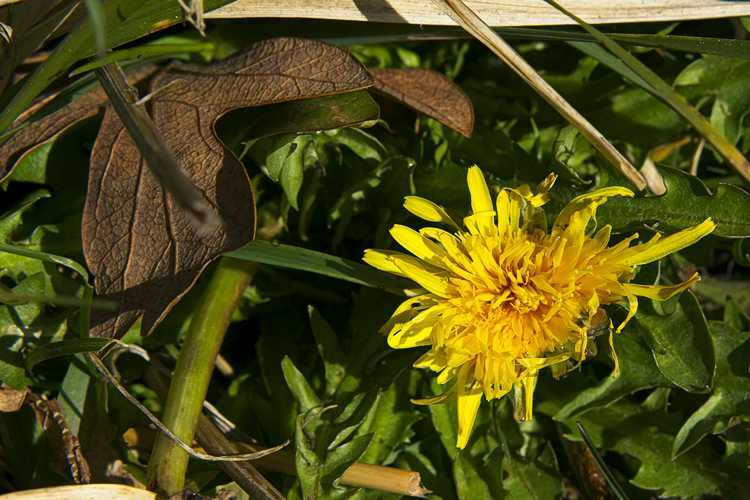 ← Earth Day: Plant Something for the Bees! 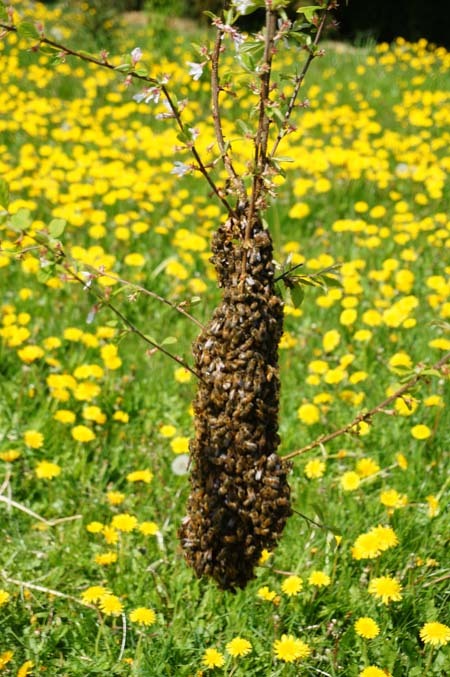 This Bee Swarm Saga is, as some short stories are, rather long. If you want to skip to the lessons learned, go ahead to the bulleted items at the end. If, however, you want to grab a beverage of choice and hear a true tale of determination, courage, against-all-odds survival, instinct over reason, fate, and loyalty to the point of willing to give up one’s own life for the protection of one’s brethren, then this is the story for you. It was one of those typical mid-April days when you look around and realize everything has exploded in your absence – you must have been snoozing, right? I mean, suddenly the back field is completely yellow with dandelions, the grass is approaching hip-high, all the mustard / brassica family veggies that wintered over are 5 feet tall and covered in yellow blooms, the raspberries and blackberries (that did NOT all get pruned) are all leafed out, and that big old matriarch of a cherry tree out back is a dense thicket of fluffy bundles of cotton candy bobbing at the tips of slender branches. Wow. Spring is suddenly here in a big way. It was one of those days when I was so overwhelmed with all the things that needed to be done, I didn’t know where to begin. Seeds needed to be planted. I needed to make places to plant them — but I couldn’t see the (food) forest for the weeds! Scythe to the rescue! I sharpened my blade and started swinging, which eventually settled into a rhythmic swoosh – swoosh – swoosh. I weeded, mulched, gave each bulb of garlic a little TLC, cleaned out a beehive that didn’t make it through the winter (for a future post), and in a testosterone moment, destroyed a couple of baby tent caterpillar nests with the light touch of a blow torch (I don’t have a lot of sympathy for something that threatened to defoliate our fruit trees last year). 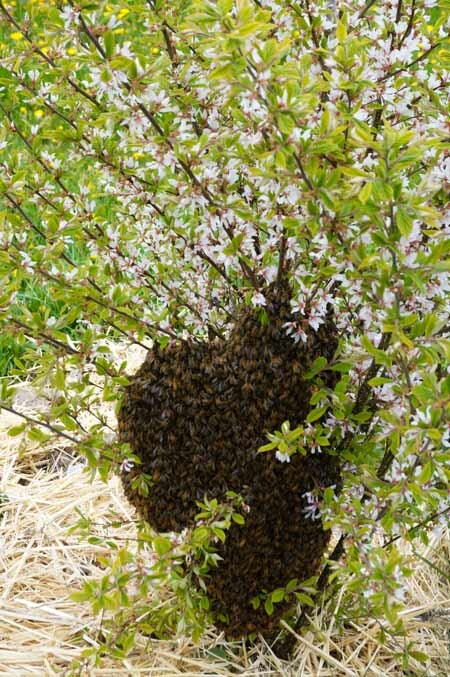 I was just about to collapse at the end of the day, glanced over my shoulder, and what the heck – there, all wrapped around the branches of my beloved Korean Cherry bush, was a swarm of bees! Was I so busy looking down that I failed to look up and see this happening?? Wow. Very early to be swarming! And the timing was terrible. Not only was I dead-dog tired, but dark clouds were moving in and the forecast was for spring storms over the next few days. There were 4 good things about the timing, however: 1) I had just finished cleaning out an old hive, so I had a hive available, 2) there was some empty comb that could be used to entice them to stay, 3) the bees in the other hives had already retired for the evening, except for a few stragglers still hanging out at the ol’ watering hole (Go home! You’re drunk! ), and 4) I still had about two hours of precious daylight left. If I hurried and set the hive up, and all went according to plan, we could get them under cover before nightfall. There was no easy way to get the bees off the small shrub. They were wound around so many branches, I would have to cut the whole thing down or somehow shake them off. We chose the latter route. Jeff held the bucket beneath the branches as best he could while I gave the shrub a good solid shake. A whole bunch fell in a big surprised clump. 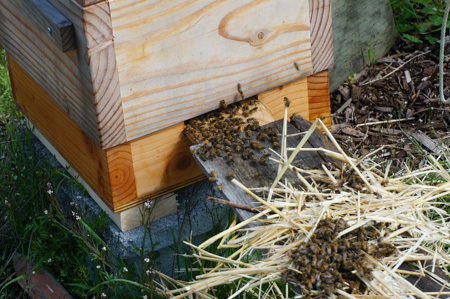 I quickly put on the lid and, while many took flight and more clung even tighter to the branches, we took our catch over to the hive, removed about 5 bars, dumped them in the hold as quickly as we could, and covered them up with the cover cloth, quilt, and roof. There was no time for a gentle, “Let’s see if we can coax them inside.” It was more like, “Do it now; there’s no time to lose!” It was a LOT of bees, but by no means all. I could only hope their beloved Queen was with them. I have to give my husband credit for being such a calm person. I had put on some protective gear for this whole event, and even so, at the height of confusion, two little bees managed to find their way into the helmet, exactly where I would least want them! It’s that awkward moment when you look a little cross-eyed at the bee in front of your nose and realize she is on the inside of the screen, not out. At one point in the midst of bee chaos, even Jeff admitted, “It’s a little too hot for me right now,” and stepped back. Respect is good. But the good news was – the next thing we knew, numerous bees were standing on the landing board at the entrance, their tails in the air, fanning their wings. SUCCESS!! They were calling their sisters! They had, it appeared, accepted the new hive! 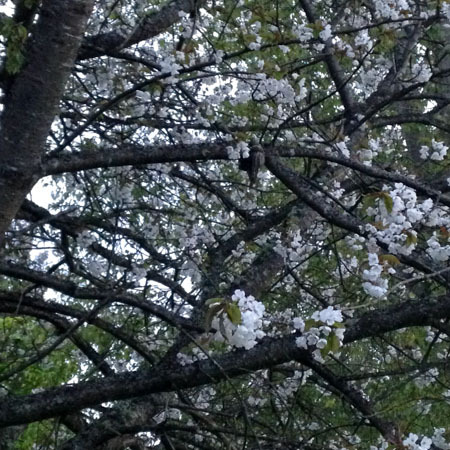 Back at the Korean Cherry, though, there were still a LOT of bees – more than I had hoped. The ones in the air were settling back in with the cluster. There was no way to brush them off at this point and reopen the hive. I had to trust that they would follow the call of their hive mates. We left them alone. That night it rained. It rained quite hard, in fact. I lay awake worrying about whether the bees found their way “home” or whether they were still huddled there in the branches; whether it was better for them to be dropped from the gene pool, if that were their fate, or whether Nature would grant them some mercy. I got up early the next morning, and at 6 a.m., I have to say, it was cold and wet, but not freezing. The bees were still there! A mixture of relief and consternation! As in WHAT are you still doing here?? Maybe a swarm trap will help, I thought. I set one up on a bucket near the swarm. I put a little broken comb inside. Throughout the day, as I weeded nearby between drizzles, many were checking it out. Bees were also at the hive, calling, calling. My neighbor was taking advantage of the relative break in the weather to mow her lawn. I felt like telling her to turn the noisy thing off! How could the bees hear the sirens of their sisters? By afternoon, the shrub bees still hadn’t budged. Over the next couple of hours, a small, but prophetic weather system moved through. The wind picked up in a fury and again, down came the rain. The cloudburst didn’t last long, but long enough to let the bees know it was not a good time to be outside. They protectively tightened their cluster. 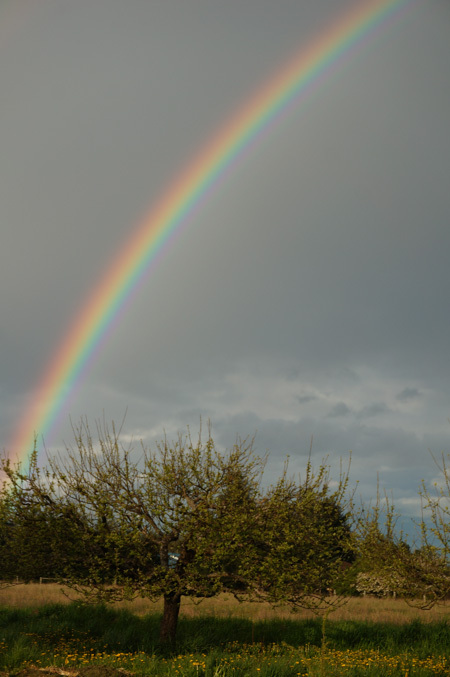 As the sun set low in the sky, the weather turned to a mixture of sun and drizzle, and a beautiful rainbow magically appeared in the dark eastern sky. This was their chance! Make your move! What to do – should I interfere at this point, or let them follow their own instincts? I figured I needed to learn to trust that the bees knew what they are doing. Surely they would take cover in the swarm box or head for the hive! I left them alone to make their own choice. I regretted that decision. In the evening, the wind came up stronger than ever. The Gale-Force winds forecast on the marine weather site were now a harsh reality. The storm was worse than I anticipated. Much worse. I felt a strong pang of guilt. I should have helped them. The rain was almost like sleet, and the wind hurled it at our kitchen window with a pinging that sounded like little beebees hitting the pane, and that is an unfortunate choice of images that I could not erase. It was dark, but I had to go see. I grabbed a headlamp, pulled a hood over my head, and ventured out. Oh my gosh! It was painful – the rain stung, I was physically staggering in the wind, and then to see this cluster of bees, their wings tightly clasped closed, each clinging tightly to their neighbors. They looked absolutely miserable. No one was moving. I couldn’t do anything about them now. I didn’t see how they could possibly survive. Another sleepless night. I could have been more aggressive about moving them. But I was not. Thousands of bees might die because of my inaction–me, who tries so hard to save every single little bee. It was a strong lesson. In the morning, up at the crack of dawn. It was amazingly calm. Lo and behold! They were still there! 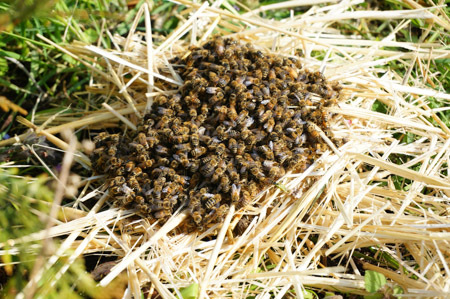 But a big clump of bees lay in a heap on the straw beneath the shrub. More were still hanging from the branches. All looked dead, but the heap looked definitely dead. I got a pitchfork and gently lifted them up. No one moved. I took them over to the new hive and set them in the sun on the ground nearby. I gently spread open the pile a bit – just in case someone might be alive in there. After doing the autopsy on the hive the other day, I was pretty sure I knew what a dead bee looked like, and these all looked like goners. I was terribly sad. I went back to the house to get some coffee and wait for it to get a bit warmer. 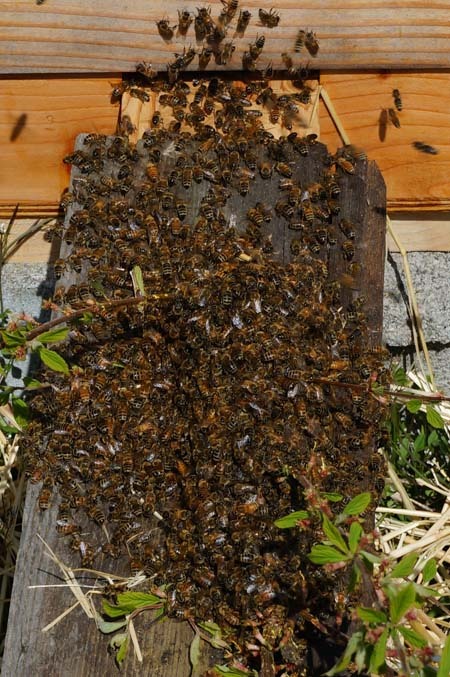 When I came back out – who would think – but the entire pile of bees was moving! This was a-mazing! And at the little cherry shrub – also LIFE! As the day wore on, I was surprised to see that the clump of bees near the hive stayed in their clump. Perhaps they were too exhausted. But they were moving about. Perhaps ensuring everyone was still there? Did they not hear or recognize their sisters in the new hive? I mean, shelter and warmth were just 2 feet away! Ok – no more “let them be bees” mentality here. I was NOT going to let them sit out another storm (a series of systems was forecast for all week!) I placed a board from the ground up to the entrance landing. I once again picked up the bundle on the straw with a pitchfork and gently placed it on the board, just outside the door of the hive. THAT sparked some interest! They started to move in! And many started fanning at the entrance, calling all their sisters! Once they started going, all of them followed in solidarity. HOORAY! But what about the bees still huddled on the shrub? Did they rush to join them??? No. In fact, not at all! In FACT, if anything, they were pulling together and hunkering down for another episode! WHAT IS WRONG WITH YOU BEES? I was almost yelling at them! Ok – I told myself – they just survived a hurricane by their standards, so just calm down and help this situation. There were fewer now, the majority of them clustered around a singular forked branch. A friend stopped by and helped prune it close to the trunk while I held on to the branch. It really helps to have two people do this operation to minimize any abrupt movements. We calmly carried it to the hive and placed it on the board near the entrance. The next thing we knew, they, too, were following each other into the hive, some standing at the entrance fanning to let the others know that this was the place! Unfortunately, though, not all bees were on the branch; some remained on the shrub. I brushed what I could onto a shovel, where some, seemingly stunned, actually stayed while I carried them to the board. I did this repeatedly, probably a good dozen times, until there were only a few left. It was at the point where I was stressing them more than helping them, so I left them. At least I saved as many as I could. In the morning, none were left on the Korean Cherry. I didn’t look for corpses in the mulch; I choose to believe they joined their sisters. The happy ending to the story is that the bees are loving their new hive! They are out and about and returning with pollen! Considering all things, very few bees were sacrificed in the moving process, traumatic though it was. But the experience made me think a lot about this whole thing about swarming. I don’t have any scientific evidence, but I do have some opinions (!) based on my observations. And based on that experience, I would like to clear up some misconceptions that many of us who are enamored with this gentle fuzzy honeybee, aka Apis mellifera, hold dear to our hearts. Please forgive me if some of this sounds like blasphemy. Bees do NOT have a “third sense” about the weather. Why, oh why, did they decide to swarm on a day when dark clouds were brooding to the west?? Ok, sure, the day was a bit nicer then the stormy day before; but there was no indication whatsoever that we were in for a balmy streak. Quit the opposite. This is early April in the Pacific Northwest! We don’t get balmy here. My feeling is that they must be more motivated by conditions in the hive – there must have been new bees hatching out and the older ones were getting a little too claustrophobic. Bees do NOT necessarily follow the fanning call of their hive mates. These bees were not that far away – but their survival instinct told them to huddle together for protection and warmth, and that instinct was stronger than the urge to go to where their sisters were. Unless they are all swarming at once, those that are separated will stay together with the other separated ones for the protection of all. Bees will not leave the cluster to get out of the rain, even if they have already explored potential shelter just 2 feet away. Did I perhaps not capture the Queen? Was she hidden in there somewhere? I did not see her, but if she were there, no one would ever abandon her. Again, the urge to stay together for the survival of all, and especially for the queen, is stronger than anything the individual might think might be a good idea. I would even suggest that bees do not think much, if at all. 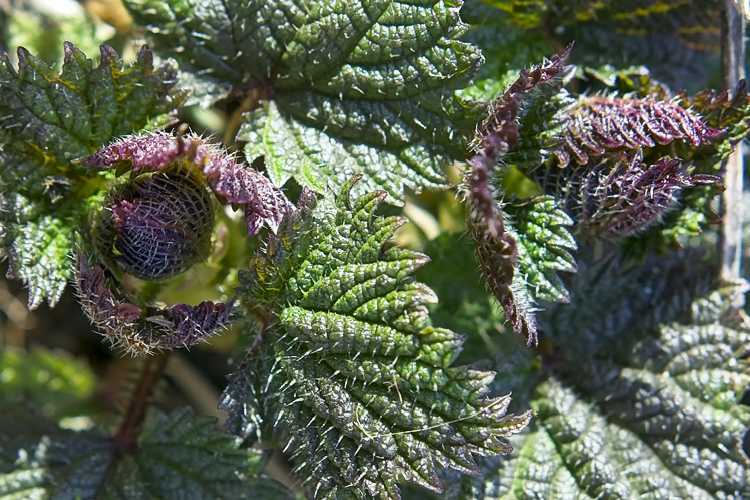 Granted, they are little bundles of sensory perceptions – very keen sensory perceptions, true – but thinking things through is not necessarily part of the process. They may be in tune with the Earth’s magnetic field; perhaps they can even tune in to the electromagnetic waves that precede thunderstorms, which tell them to hunker down tighter instead of taking flight; I have read that they can even create their own static electricity, which helps them to harvest pollen; they can communicate by dancing and can thereby give directions to a food source or a potential new hive with amazing accuracy; they can fly 5 miles in search of food and somehow find their way home; they are stronger than ants – they routinely carry their own weight in pollen; they can see ultraviolet light; they are experts at building perfectly sized hexagonal cells for different purposes; they somehow know how to make honey, propolis, and royal jelly, powerful substances we are only learning about; they have the ability to disengage their wings and control their temperature, which is perhaps how they managed to withstand a storm that tossed a plastic chair across our yard, and they are extremely efficient at regulating the temperature in the hive within a couple of degrees; they can even gang up on a predator and smother it to death; but do they THINK??? Do they take all these sensory perceptions and make sense of them? Do they have reason? Emotions? I do believe that bees can experience curiosity, excitement, agitation, aggression, and fear – I have felt these around the hive – so why not bliss? In the end, however, I believe that for the bee, Instinct Rules. And the instinct that tells them that their survival depends on their staying together can overrule every other instinct and can also be the very instinct that does them in. Bring on the science and tell me otherwise! For now, I see my role as providing a safe haven and helping the bees where I can, learning when it is best to step in and when it is best to step away, and somehow having the wisdom to tell the difference. And if their little bee brains tell them differently, then it is also about accepting their interpretation of the sensory world around them – something that I, despite my relatively large cranium, cannot yet hope to fully understand.